Social media is something millions of businesses are benefiting from, but there was a time when social media wasn’t something for businesses. Instead, it was considered as “something for the kids” and certainly not something to pay attention to as a brand. Then something happened. As the social media users increased, those brands who were early to the party realized that “if our customers are spending their time there, why aren’t we taking advantage of that?” Since then, social media marketing for brands has only grown in popularity. As more and more businesses are realizing the true potential of it, the idea of social media being something only for the kids is slowly fading away. If your business isn’t on social media, I can tell you that you’re missing out. Here are the Top 7 Reasons Businesses Should Use Social Media. Every day, an insane amount of content is being shared on social media, and if you just bother to listen to some of the things being said, you can gain a lot of valuable insights from it. The best way to improve your business is by asking your audience what they think. In many cases, you don’t even need to ask for your customer’s opinions on social media, as many gladly share their opinions completely on own initiatives. There are many ways to get your customers’ opinions on social media. One is through daily active engagement and social listening. By doing this, you can get valuable insights in what your customers are really thinking about your brand. Based on the tips for improvement you receive, you can improve and adjust your company accordingly. A second way of learning from your audience is by scrolling through hashtags or check-ins. Depending on how large your business is, you may or may nor be able to do this. If you on the other hand have the possibility to do this, you can get a ton of insights of what your customers are saying. If you have a hashtag for your business, for example your brand name or if you have seen people using a hashtag dedicated to your brand, this is a great way to start. 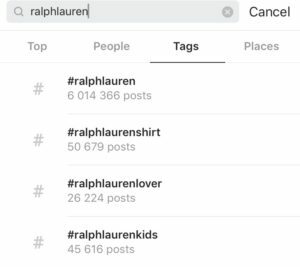 When searching for “RalphLauren” in Instagram hashtags, we can see that there are a lot of differen thashtags being used regarding the brand, for example “ralphlaurenshirt” and “ralphlaurenlover”. We can also see the total amount of posts have been made with respective hashtags and in this case – it’s a lot! 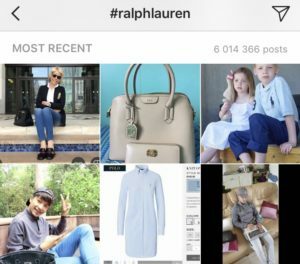 If Ralph Lauren would go through some of the content in these hashtags, they can be sure to learn a lot about their customer’s experience with the brand and also get tips for improvements. By going tapping on an individual hashtag, in this case “RalphLauren”, you can find all the content that has been posted with that hashtag, and how many posts has been made. The second method demands that you have a physical location where your customers can check in to. Most social media platforms have the check-in feature but ‘ll use Instagram as an example. The check-in feature can be found just right next to where you search for hashtags. If I search for “Ralph Lauren” in the check-in, I will get various Ralph Lauren venues where I can check in to. This is what RL can take advantage of. By scrolling through the posts that have been checked in at RL, they can see what their customers are saying in real-time. And you can do the same if you have a physical location! You’ll be amazed at how valuable this information is. To see what your audience is saying in real-time, you can use Hootsuite Insights. With this tool, you can for example get information from all your social media platforms at the same time and listen to conversations regarding your brand. It’s difficult to get to know your audience on a more personal level as the gap between customer and business often is very big. Social media helps reduce that gap, enabling you to engage and converse with your customers in a genuine and personal way. By doing this, you’ll learn what your customers are doing and thinking, which can be really valuable in predicting changes in the industry, based on what the customers are demanding. Thanks to the fact that you get to know your audience, you can get an edge over your competitors not only because the customers trust you more but also because you can be the first with new products that the marketing is screaming for. Social media is a very effective tool for building brand awareness. By simply having a presence and being active on social media, you make it that much easier for customers to find you and engage with you. The best way to build brand awareness is growing your page while engaging with your audience. Ask questions, offer to help and thank your followers for their support! All of these parts are vital for a successfully built brand on social media. According to Nielsen, as many as 33% of customers prefer to contact brands through social media channels as opposed to calling or emailing and waiting for an answer. 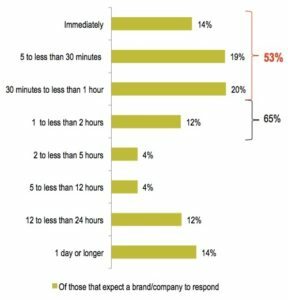 In addition, consumers expect brands to be active on at least 3 social media channels. This means that social media becomes a natural connection point for them – choosing social media as the obvious question/complaint/messaging tool when contacting brands. In short, customers want, and expect you to be on social media, so while listening to your audience, you’re also transferring from the old-fashioned way of taking care of customer service, and going to more effective and modern ways. Saving you both time, energy and resources while, in the customer’s eyes, providing a better customer service. In the day and age where you can reach anyone 24/7, people don’t want to wait hour and hours. 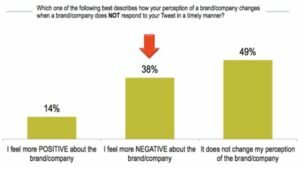 In fact, a study made by searchenginewatch found that 53% of Twitter users who Tweet a brand want a response within an hour. Social media can generate great results when it comes to increasing website traffic. Both with paid ads and free methods. The first way is of course direct traffic when people tap the website link in your bio or your Tweet. The second way social media helps increase your traffic is generating traffic as an indirect result of social media. Here, we’re of course talking SEO (Search Engine Optimization) and Search engine ranking. Google hasn’t taken social media indications as a ranking factor when ranking your website. That was until a few years ago. Even though it may not have a huge ranking effect, having a strong social media presence can help increase your search engine ranking, even if just a tiny bit. When ranking higher on search engines, people will find your website more easily and ultimately, you’ll get more website traffic. When Google looks at pages, they look at individual posts such as a Tweet or a Facebook update. Google also looks at the quality of the mentions your website receive. For example, you can’t expect to “fake” your popularity by buying fake followers for your social media page. Your main objective should be to gain genuine and high-quality followers, just like building backlinks to your website. It’s all about quality. Because Google have a hard time crawling social media pages, they aren’t focusing too much on social media when it comes to ranking. Google takes social media indications such as mentions, posts and comments into consideration. This means you want to encourage your followers to share your content. If your competitors have realized the importance on social media, they are probably to be found there. It’s difficuly to get access to your competitors’ email lists or customer info, but with social media, this can be done, even at a slightly smaller scale. The first method is simple. Go to your competitor’s social media account and look at the comment section. Read the comments they have received and see if you can do anything with that information you’ve gotten. They might have received a very angry message from a disappointed customer, but still haven’t answered, or simply given a very bad answer – then you can take advantage of this. Either make a list of the accounts you found that was unsatisfied with your competitor and write to them, or write to them directly once you find them. Tell them you saw that they were disappointed with your competitor and let them know about your brand. The second method is going to your competitor’s social media page and reading through the comments.. Here, it doesn’t only have to be comments regarding complaints, but it can be any comment, except spam comments. These won’t bring you any value. Now that you’ve found a few people who looks like they have something to do with your competitor’s brand, or at least likes the same niche, message them and let them about your own brand. If you offer the best prices on the market, let them know! Method 3 is a little less targeted but can still help you get your brand out there. Go to your competitor’s social media page and check their followers or likes on a post. Now, you’ll get a list of their followers or people who have liked the post of your competitor. This will make them become aware of the fact that your brand exists and if they are following/liking the pictures of your competitors, they are most likely potential customers for you as well! This is only possible if your competition has a brand hashtag, but if they do, it’s super effective. Go to their hashtag and take a look at the posts that have been posted with it. Most often, those who have used it are customers of the brand, so why wouldn’t they be able to become customers of you as well? Like a few pictures of theirs, follow them or write a personal message to them. Which you choose is completely up to you. Social media is a great place to find like-minded people and build a connection with them. Social media is a two-way dialogue and often something a lot of brands miss. They solely post promotive content after promotive content without listening to what their followers have to say. Listening to your followers and then sharing your own perspective and experiences can help you build valuable connections that you might need in the future. One example is influencers. Social media influencers are industry-leading individuals with a large following on social media that they have a large influence over. Shortly summarized, it is a person who people are looking up to. Influencer marketing is when brands are using influencers with an already established voice in the community to reach their target audience. Before this is done, it’s good to have build connections with possible influencers you might want to work with, as they will be more positive in helping you.